League of Angels 2 is a free to play browser RPG where players are the lead protagonist in a story-driven epic tasked with recovering the Might of Valor, a powerful relic that has possessed the minds of many of the legendary heroes that normally protect the realm. Players must build up their team of heroes and fight through various PVE quest stages and dungeons to earn resources and become even stronger. The Plague Queen has come into the possession of a powerful artifact, a hammer known as the Might of Valor that has the ability to take over the minds of the powerful Angels that once protected the world. With her Orc Legion she now has control over an army of Angels that you must help restore. 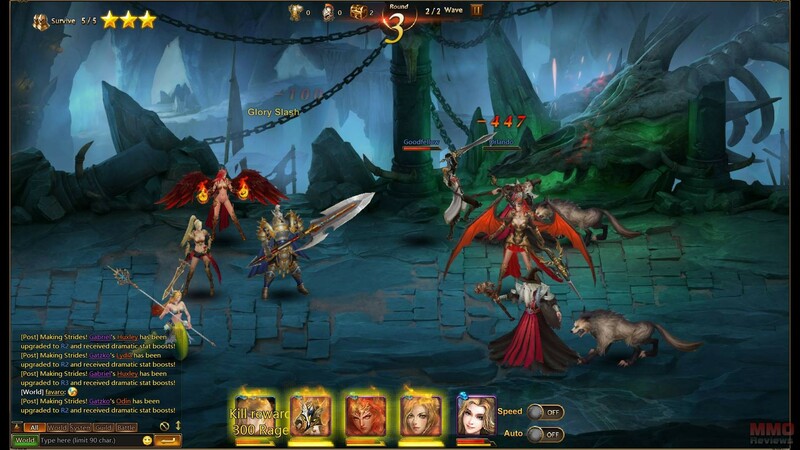 The core of the game is a hero team building strategy where players gather together a variety of characters into a group and try to defeat different quest stages and dungeons that grow increasingly more difficult. The strategy comes in building up the perfect team, with a large choice of heroes to choose from, different gear items, and numerous formation tactics players will have to plan ahead and change their strategy to overcome different battles. The game has a loose RPG story element that players progress through as they defeat various PVE solo stages in the game, earning XP, levelling up and improving their Battle Rating (BR) which represents their overall power. There are different ways to unlock new heroes in the game, but each of them has unique stats and skills that determine their role in battle, ranging from Tank, DPS, Heal Support and others, having a varied group able to focus on key aspects is vital to being successful in the game. When heroes are acquired then they are independently levelled up by gaining access to Prisms, resources needed to level up each hero to boost their stats and unlock more skills, Heroes can only be as high as the player character’s own level which is increased by earning XP from battles. Players are able to have a maximum of six characters in their Squad (by the time they reach level 18), though they can have far more heroes in their collection they can only take six into a battle at any one time. The choice of heroes mainly comes down to the players preferred strategy, such as focusing on defensive heroes to mitigate damage, or extra DPS to be a more aggressive fighter. The formation of a Squad is two rows of three and players get to choose the positioning of their heroes in the formation; Tanks typically sit on the front line whereas supports and squishy DPS are best on the back line where they can be defended. Each hero’s abilities may have a special quality on them to determine where they target, such as attacking the column directly in front of them, or attacking the entire backline; this makes positioning in the formation even more important. Combat is extremely automated and players have very little involvement in a battle once it has begun; the player’s heroes and their opponents load into the instanced battle screen and begin fighting each other exchanging blows and building up rage to trigger their hero ultimates that deal significant damage or buffs. Players are able to choose when they use their ultimates giving them a slight bit of involvement, but the main gameplay is outside of the battle and choosing the right heroes for the squad. There are lots of combat focused events to get involved in, including World Bosses, Multiplayer Dungeons, solo content and lots more; players can battle against one another in the Arena in PVP, fighting against each other’s teams however whilst players can choose their opponents they are completely AFK in the battle and can’t trigger their own ultimates.